Today I have to get over and work at the high school so I only have time for a short post. We only have about a month and a half till the end of our school year (yes we end on May 30). I always help the 8th graders with their teacher gifts so they get done and the students help make the gifts. A few years ago we did these succulents in mason jars and they were a hit so I thought I would put a new twist on them this year and repurpose them. This year is the 100th anniversary of the mason jar so they have this pretty blue one available. I bought a few dozen for the students and they are busy collecting shells and glass to put into them. Then I will harvest succulents from my yard and buy a bag of green moss for them to put together. Basically succulents will grow and root in anything. 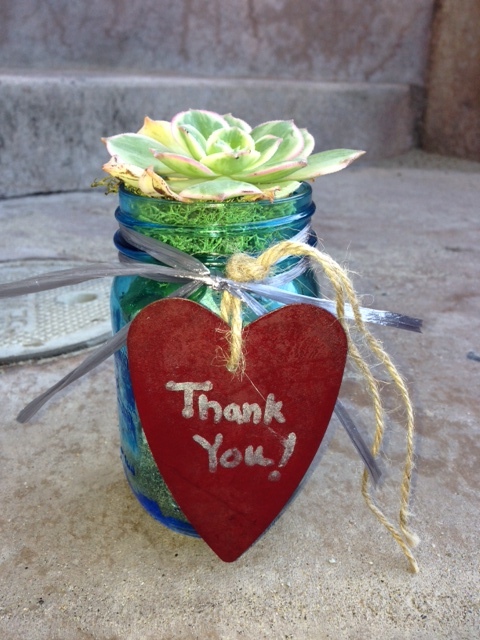 The students will line the jars with shells and glass then put the succulent on top with some moss. Add the ribbon and the hearts that say thank you and you are done. You can purchase the hearts from factorydirect.com. I sprayed mine red to go with the blue mason jar.